You are missing out if you haven't tried popchips yet. popchips and Esperanza Resort (@EsperanzaResort) have teamed up to bring Metro shoppers across Ontario a chance to win a trip for TWO to the world-renowned Esperanza Resort in Cabo San Lucas, Mexico! 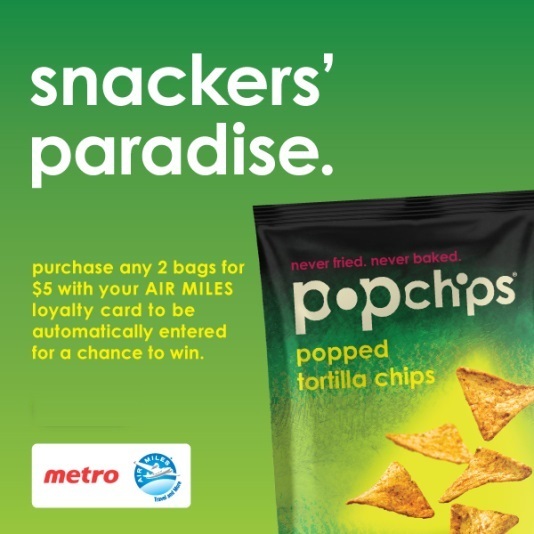 With the purchase of any 2 bags of popchips for $5, shoppers can swipe their AIR MILES card which will automatically entered them in the contest! That's it! Total value of the giveaway is approx. $7,000! The contest is already underway and ends at 11:59:59 PM Eastern Standard Time on May 30, 2013.